Javier Orozco is Executive Director of Human Dignity and Intercultural Affairs for the Archdiocese of St. Louis. At our fingertips is a vast depository of directions and resources to improve ourselves. A quick Google search yields seemingly endless options. For those comfortable with self-help techniques and methods, the selection is expansive and goes beyond any particular spiritual, faith or religious practice. The same holds true for those who prefer a more group-guided experience. Whether through directed mental meditation or physical core-training exercise, practitioners are content with blending traditions and practices. Clubs, associations and gyms offer mental and physical disciplines designed to bring greater success to our desires for personal change and transformation. Although we readily point to these new and present-day practices because of accessibility, attractiveness or prevalence, we also recognize that the desire for change or conversion is much older. In many ways, the hunger for greater personal transformation transcends any culture or time. History shows us just how ancient and profound this search for conversion and wholeness truly is. Our libraries are bursting with philosophical, theological and scientific treatises expanding the breadth of human consciousness and curiosity. The same can be said of our interest in aesthetics and literature which collectively reveal a horizon of vivid images and powerful stories capturing our imagination and spirit. For the religious believer, in particular, the desire for conversion and wholeness already finds echoes in the countless works detailing the lives of holy men and women. In these saintly lives, we see how driven they were in their spiritual pursuits and disciplines. For instance, we point to St. Therese of Lisieux, St. Augustine of Hippo, St. Clare of Assisi or St. Ignatius of Loyola and note their thoughtfulness and determination in seeking holiness. So whether we find ourselves reflecting with the saints in the landscapes of France, the African countryside, the Italian villas or the Spanish plazas, the hunger for holiness and personal transformation persists. What these holy men and women reveal is precisely the holy longing for what is most good, true and beautiful, and they witness for us the relentless and tireless quality of the human spirit. I suspect that the spiritual journeys, longings and disciplines we choose to espouse will differ according to our temperament and personality. For some of us, our spiritual quest will take us to spaces of silence and serenity; for others among us, the search will involve a busy and noisy digital landscape of images, words and sounds. Regardless of where we situate ourselves, already, as Catholics, we are invited to enter a space and search for a deeper meaning and wholeness in Christ. Our Lenten journey and disciplines of fasting, prayer and almsgiving recall the importance of conversion and change in our lives. This trifold discipline of fasting, prayer and almsgiving provides helpful directions for us, precisely because it intensifies the need to adjust and recalibrate our hungers, desires and actions. Like Jesus who goes into the desert and is tempted (Luke 4:1-13), we, too, are invited to go into our own desert and there confront more directly what often gets in the way of our relationship with God and our love for others. As this Lenten journey continues to unfold, let our search and hunger for God and holiness be what it needs to be: seeking Christ in faith, hope and love. 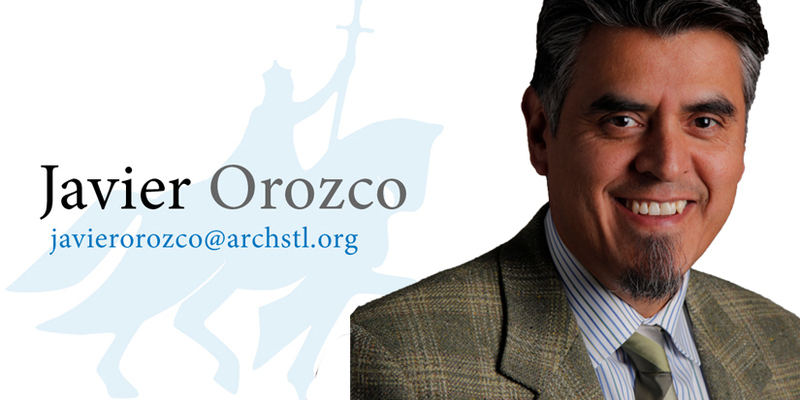 Orozco is executive director for human dignity and intercultural affairs for the Archdiocese of St. Louis.